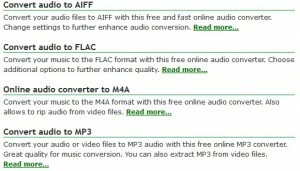 Home › Audio file conversion › Lossless Audio File Types – What Options Do You Have? Lossless Audio File Types – What Options Do You Have? There is no question that it can get very confusing when you are looking at all the different audio file types that are out there. If you have to convert old audio files, or even when you buy new music, you frequently have to pick a specific type of audio file to use. However, if you’re like most people, you basically pick the one that looks the easiest without having much knowledge to back up your decision. Regardless of the reason you need to convert your audio files, it’s important to know the difference between the different audio file types so you can make the best decision. The first thing you need to know is the difference between lossless and lossy audio formats, which we covered in this post. However, that is only the first piece of information you need to know. In this article, we’ll talk about the different audio file types that are specific to the lossless format. These two formats are uncompressed. That means the quality of the music in these files is as close as possible to the original audio source. The quality of these two formats is the same, but they are quite different in the way they store the data. The WAV file is relatively universal, while the AIFF file is specific to Apple, so you may have problems if you try to store this type of file on on-Apple products. This type of file is the Free Lossless Audio Codec. Since this is a lossless format, the quality of the audio is very high, but unlike most other lossless formats, this one HAS been compressed. This means the files don’t take up nearly as much space as the WAV and AIFF files. This unique combination makes this the best audio file type for casual music listeners. For those who are a little more technical, this file type is also free and open source. The ALAC format (Apple Lossless) is the best choice if you want to listen and manage your music through both iTunes and iOS, because it if fully supported by both systems. This is another lossless file that is compressed, however the compression isn’t quite as impressive as that of the FLAC file type. If you use this type of file it will take up a little more space than the FLAC files, but not nearly as much as the WAV and AIFF files. An APE file is a lossless file that has the most compression, so it takes up the least amount of space on your computer. 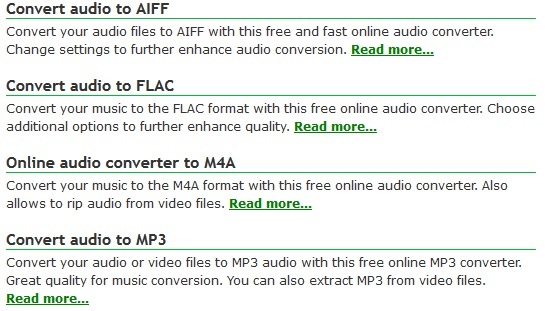 The quality of the audio is also equivalent to ALAC, FLAC and similar lossless files. However, the problem with the APE audio file type is that it isn’t supported by very many devices. The only time you would want to choose this type of file when you are converting your files is if you specifically have devices that are compatible, and you don’t plan on changing those devices in the future. These are the major audio file types that are lossless formats. In a future article, we will review the lossy formats to help you decide which file type is the best for you. Once you determine the proper type of file for your needs, you need to find a good online audio converter to do the job for you.